The joke's on you! 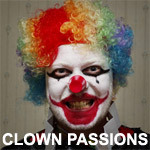 Favourite clown? The Joker. Cop out answer? I guess but he is everything a villain needs to be. Shaco is pretty awesome too. I don't think I know any real clowns. But I love everything about them. Love payasos! I love chispita divina the clown. She is my loving clown from the border. Does yhvhwarrior777 belong in this group? Boso the Clown is the best. My fav clown movies is "IT" and "Killer Klowns from Outter Space." Does soultaker5683 belong in this group? Does loranna belong in this group?